"This is the prairie that nature built." Starting with the critters that worm and squirm under the prairie, and the diggers that burrow, to the plants and insects, birds and beasts... all playing essential roles in maintaining the prairie. What I like about this book: it's fun to read. Everyone has a role: tunneling, rooting, providing food, hunting to keep the population in balance... every part is important to the whole. I also like the detailed illustrations, and the way Cathy Morrison uses the page. Sometimes you need to turn the book to get the full length of it all, from root to sky. I also like how, in the end, author Marybeth Lorbiecki brings the prairie home to us, as a place where a child and her dog could roam and explore. As with all Dawn books, there is great back matter. This book ends with a "Prairie Primer" and some more detailed notes about the soil partners, grazers, flowers and other life essential to the prairie ecology. There's a page full of Prairie Fun activities, and some resources: books, websites and more. Beyond the book - if you live near a prairie, get out and explore! What plants, animals, and bugs can you find? Take along your nature journal so you can sketch what you see. If you don't have a prairie nearby, see if there's a botanical garden nearby with some prairie grasses and flowers. Plant some prairie seeds. Even if you don't live near a prairie, you can plant some prairie flowers in your yard - or in a paper cup. Here's a list of some of the flowers found on prairies: larkspur, purple coneflower, black-eyed susan, goldenrod, asters, anise hyssop, blue lobelia, milk vetch... you can find prairie seed mixes here and here. Fall is a good time to plant prairie seeds if you want to turn a patch of your back yard into a habitat for birds and butterflies. Read an interview with author Marybeth. She talks about growing up on the prairie, and her efforts to restore prairie landscape. Today's review is part of the STEM Friday roundup. Drop by STEM Friday blog for more science books and resources. We're also joining PPBF (perfect picture book Friday), an event in which bloggers share great picture books at Susanna Leonard Hill's site. She keeps an ever-growing list of Perfect Picture Books. On Monday, we'll join the roundup over at the Nonfiction Monday blog where you'll find even more book reviews. Review copy provided by publisher. I Love all purpose blog reviews like this one, Sally. Blogging once for three reasons, PPBF, STEM and again for nonfiction. Great choice, too. We live on a prairie - one that's on the edge of a city. We'll find this one. Thanks for the recommendation. cool - and maybe you can post a photo on your blog? What a fantastically important book for kids! Every creature has its role to play and they all need each other. I'll have to sniff this one out! Thanks! Hmm. This book seems familiar, but I can't place it. Ah well, we'll just have to check it out this weekend to clear up the mystery. Thanks for the flower suggestions. It's autumn here, but I'm already dreaming about sowing seeds in the spring! I love books that show/teach kids about the interdependence of all life. A prairie is a good example. And, we have connection to the prairies too. Thank you so much for the nice review of The Prairie That Nature Built. I'm the illustrator and loved working on this book. I live on a short grass prairie and learned tons while doing research for the illustrations. what great illustrations - they look like you just walked out and painted what you saw. And I really like the vertical pages! Thank you Sue, Dawn was the first publisher to let me do vertical illustrations, something I've always wanted to do. I can remember a couple of other books that have that and just think it's a fun touch as long as it works with the story. And I walk my dog, Crowley twice a day (he's the dog in the story) and would notice things about the prairie on our walk, the grasses, rock formations, a lot of subtle things about the prairie that I wouldn't normally pay attention to. I love Marybeth's writing so it was fun to illustrate it. I really hope kids enjoy the book. I love the cover! And the content sounds stellar, too. Thanks for highlighting! Sue I love a good picture book about the interdependence of life. I have never really visited a prairie so this would be great for me. Now I really want to visit a prairie. Barring that, I think I'll plant some of those prairie flower seeds in my wild lawn next spring. This looks wonderful! Having grown up on the prairie it would hold special meaning for me. Thanks! Thank you, Sally, so much, and all of you for your enthusiasm for books, this book, prairies, and using books to get kids excited about going outside to explore things alive at many levels and all interconnected. Thanks for dropping by - and for creating such a fun book. What a fascinating book. . . And I love the illustrations! This book looks interesting and beautiful, Sue! I would love to read it. 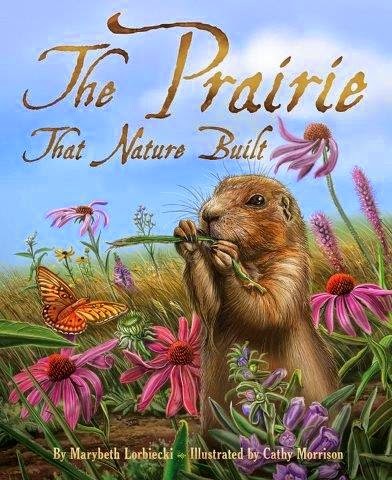 I love the cover illustration - that prairie dog reminds me a little of my friend Phyllis :) And how clever that the author found a way to tie all these interesting facts together in a "house that jack built" kind of way! Sounds VERY cool and fun - and the illustrations are gorgeous. Thanks for sharing!